Zur Zeit in der Restauration! Ein absolut originales Ersthandauto in wunderbarem, rostfreiem Erhaltungszustand. Auslieferung an die Ehefrau eines deutschen Geschäftmannes in Kalifornien. Komplett dokumentierte Fahrzeughistorie, von den Auslieferungspapieren bis zu dem Servicedokumenten. Technisch in hervorragendem Zustand, alle Fahrzeugnummern in Übereinstimmung mit der Datenkarte. Here is is a truly exceptional, extremely original, well documented, one California family owned 1969 Mercedes-Benz 280SL finished in rare and desirable factory original Moss Green Metallic (DB 834) over an original Bamboo leather interior. Retaining an entirely original body (including the original factory spot-welded fenders, telltale headlamp notches and stamped original hood) and a completely solid original undercarriage, the car also comes with its original numbers matching engine, original transmission, original hardtop, factory correct green canvas soft top, ALL of the original books, manuals, pamphlets, etc. (including the heavily stamped service booklet), the original Data Card, the original Protect-O-Plate (Certicard), the original sales invoice, service records, spare tire, changing tools and the completely untouched factory original tool kit, incredibly still wrapped in its original plastic casing. This is undeniably one of the finest, most original, complete and striking examples available on the market today, comfortable in the garage of both the serious collector or weekend enthusiast. (the Redwood City, CA Mercedes dealership) to get her opinion on colors, options, etc. While Mr. Guhl was speaking with the salesman, she spent most of her time wandering around the showroom, which ultimately prompted a less than enthusiastic reaction from her when her husband asked if she would like to inherit his 1962 220SE Coupe. It seems that she had instead fixed her eye on a W113 Pagoda, and consequently the Guhls went back into the Autohaus Brugger sales office to place an order for a new 1969 280SL. Taking delivery of the 280SL on February 19th, 1969, Mrs. Guhl would use the car sparingly, driving it between their sizable Oakland ridgeline estate, their golf club and her various philanthropic meetings until Mr. Guhl passed away in 1986. While Mrs. Guhl eventually parted with their home, she kept the 280SL for another fourteen years, her cherished sometimes transportation through her second marriage and ultimate move to an equally tony 17 Mile Drive home in Pebble Beach, CA. Throughout her ownership the car was always garaged, never subjected to the elements and serviced at Autohaus Brugger, European Motors, Ltd. in Oakland and later at Import Motors in Oakland, all evidenced by the heavily stamped service booklet. In the year 2000, at age 81, she realized that she was hardly using the car anymore, prompting her to gift it to her daughter and son and law on the single condition that she could use it upon request. They held the car in the same regard, putting hardly any miles on it and ensuring it received the same care it was accustomed to receiving for the subsequent fourteen years of their ownership, thirteen of which saw Mrs. Guhl routinely visiting the car until her death in February of last year. As evidenced by the photographs, the car’s rare, era specific and factory correct Moss Green Metallic finish is deep and lustrous, presenting beautifully and marred only by a handful of minor imperfections, most of which have been professionally touched up and none of which detract from the car’s considerable overall appeal. The car’s entirely original body is incredibly straight, retaining its original fenders (with factory spot-welds and headlamp notches) and original stamped numbers matching hood and showing no evidence of any accidents and preserving entirely consistent and correct panel fits and gaps. The original chrome trim and bumpers are in incredible original condition, the original glass and rubber is equally clean and the color matched hub-capped wheels are wrapped in Michelin tires with plenty of remaining tread. The car’s undercarriage is completely original and entirely rust-free, a testament to the car’s charmed California life and arguably the most important determining factor in investment grade Pagodas. Beautifully offsetting the Moss Green Metallic finish is the equally rare, attractive and desirable Bamboo leather interior. Completely original (with the exception of the removable floor mats) the interior is in excellent condition, reflecting merely the minimal patina one would expect of a sparingly used, well cared for example. The leather seats show minimal wear, as do the original carpets and interior panels, and the car retains its original Kangol seatbelts. The dash is also in great shape, housing an uncracked original steering wheel, original Becker radio and wood trim in excellent original condition. The car’s factory correct green canvas soft top shows hardly any wear and retains a clear rear window, and the car’s hardtop is equally clean, rarely used and mirroring the rest of the car’s original and lightly patinated condition. A lifetime of professional care and some mild sorting by our in-house German master mechanic ensures that the car is also in great mechanical shape. The original numbers matching 2.8L I6 engine starts easily, idling consistently and pulling strongly and smoothly through each of the automatic transmission’s gears with excellent, even compression across all cylinders. The car drives and brakes straight and true, the suspension is tight and the ride quality is entirely comfortable, whether tooling through town, winding through the canyons or bombing down the highway. It feels as tight and mechanically sound as one would expect from a car of this caliber, needing nothing but another doting new owner to be enjoyed. 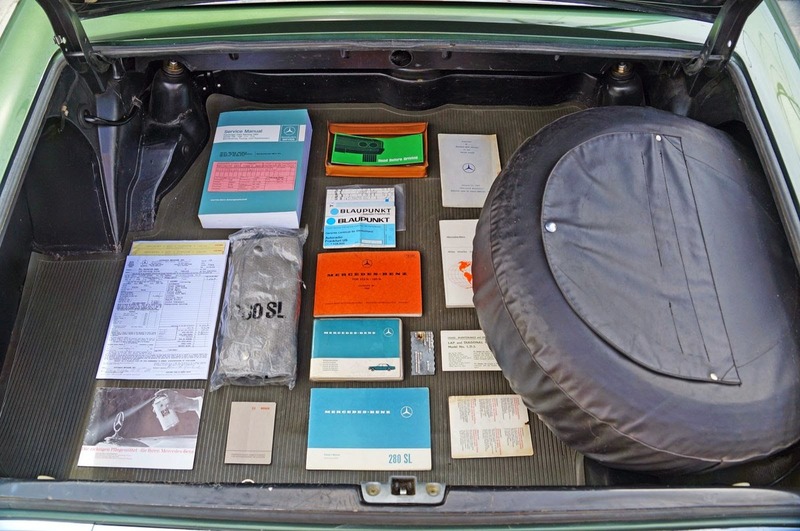 The car comes with all of its original books, manuals and pamphlets, its Protect-O-Plate, data card, recent service records, spare tire and changing tools and its entirely original, untouched factory tool kit. Also included is a copy of the original sales invoice from Autohaus Brugger showing the Guhls’ purchase price of $8,850.00 and confirming the following options: Automatic Transmission, Power Steering, White Wall Tires, AM/FM Radio, Tinted Glass, Chrome Roof Bars, Leather Seats, Metallic Paint and Bumper Guards. This is an incredibly rare opportunity to acquire what is unquestionably one of the finest, most honest, most original W113 280SLs on the market, a heavily documented, beautiful and uniquely optioned example that checks all of the boxes for the discerning collector: rust free original undercarriage, strong original mechanicals, completely original body (including fender spot-welds, headlamp notches and numbers matching hood), incredible cosmetic originality and fantastic, one California family ownership provenance.